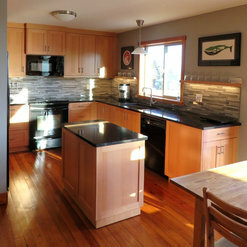 Five stars to Oak Hills Woodcraft for the design, service and quality they poured into our new kitchen! Since having our new kitchen installed, I've been inspired to cook once again, and I find that I now have a push to keep my kitchen as clean and clutter-free as possible. 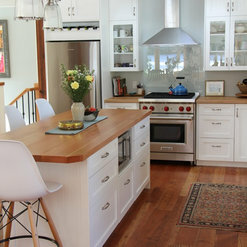 The kitchen is the hub of our household and our family and visitors couldn't love it more! Very impressed with all aspects of this project. From the drafted plans of styling choices to the quality of materials & recommendations for our personal preferences everything was top notch. All the drawers & cupboards were built in their own shop by real cabinet makers & installed meticulously by a cabinet maker in our home, on time & on budget. Aside from the fact that it added $35,000 to the value of our home, every time my wife walks into her kitchen it brings a smile to her face. Thanks Herb. We were very pleased with our experience dealing with Oak Hills Woodcraft. 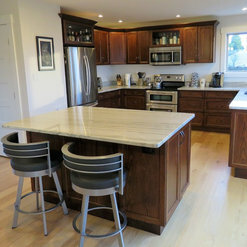 Marije was able to create a great kitchen space for our newly renovated home. She was always available to discuss our needs and was efficient in getting back to us with any changes. 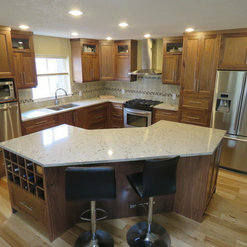 The cabinets that we chose look beautiful in our kitchen and the quality is great. 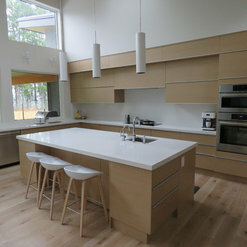 We have worked with Oak HIlls Woodcraft on both residential and commercial projects where tight timelines and quality craftsmanship were paramount. Oak Hills met both requirements with professionalism and fantastic customer support. 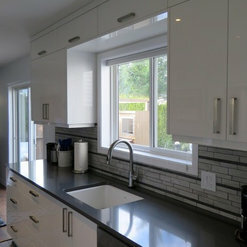 Oak Hills has a good group of qualified professionals, highly capable of providing new construction or renovation work that will compliment your life style and match your expectations. From the planning stage through completion of installation, the staff at Oak Hills remained consistently considerate of what we needed and made it happen. Thanks to all! The company designer was very helpful and creative, finding the right combination of aesthetics and pragmatic design for us, within our budget. The craftsmanship is of high quality, but we experienced some issues with the installation. The company was prompt to correct those however. From a practical standpoint, living far from the company's shop was sometimes challenging, but the designer did her best to minimize the delays. 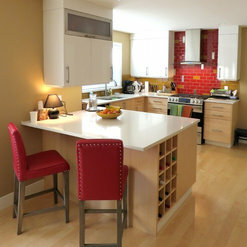 One year later, we are still thrilled with our new kitchen! We had a fabulous experience with OakHills Woodcraft. From start to finish we were listened to and supported by Marije and the team. marije's knowledge and creative imagination helped us solidify our plans. As our colour was unusual, the cabinet makers made many attempts to get exactly what we wanted. And the results were gorgeous. Their workmanship is wonderful. 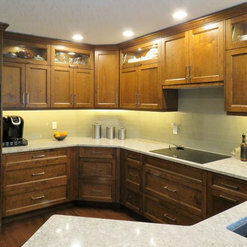 The installation of the cabinets was also a very positive experience. Mark worked so methodically, with attention to every detail. His work was exceptional. All in all, the OakHills team, particularly Marije, made the experience fun and far less stressful than we imagined. We are so grateful to them and love our new kitchen! 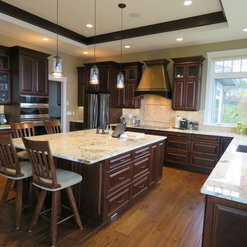 We engaged Oak Hills to design and create extensive cabinetry and mill working in a large custom home. 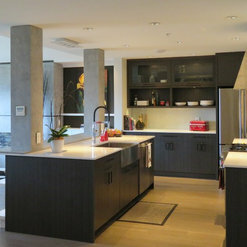 This included cabinetry and woodwork in the kitchen, laundry, pantry, office, mudroom, multiple bathrooms, bar, media centre and garage. On design, Marije was creative, resourceful, accurate and ever so patient, introducing many elements we had never initially considered. Each room design had multiple iterations using 3D graphics until we had just the right look. This lead to the precision crafting and staining of our solid wood millwork, followed by an incredibly talented and detail oriented installer. Everyone at Oak Hills was a pleasure to work with and the company exceeded our expectations. The work performed by Oak Hills has significantly contributed to the beauty of our new home. Our general contractor introduced us to Oak Hills Woodcraft and the wonderful staff there and we are very thankful that he brought us there. We were building our first home so starting this project from scratch was a bit overwhelming, however, from our first meeting with Herb & staff at Oak Hills to the final top notch cabinet installations we were extremely well taken care of and absolutely love all of our cabinetry that has been installed in our home! The staff were easy to approach answering our million questions and very patient throughout the design process. 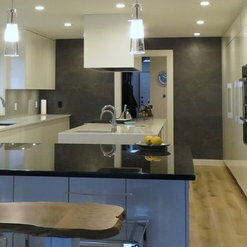 They provided us with all the information and options needed to create a very functional but beautiful kitchen as well as the remaining cabinetry throughout our home. 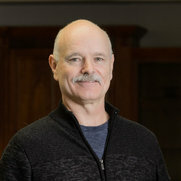 Herb and his staff provide an exceptional experience and we would highly recommend choosing Oak Hills Woodcraft for your cabinetry needs, the product quality and customer service received definitely exceeded our expectations and we know they will yours too! Thank you Oak Hills for being a part of our forever home! Marije helped me with decisions in totally renovating my new kitchen. Her suggestions were most helpful and she introduced me to the cabinet makers in the back of the shop because I wanted my cabinets to look "distressed" and they were so patient in creating the exact look that I wanted. Marije always returned my calls promptly and when I popped in one day unannounced and she wasn't in the office another consultant was most helpful. I found the entire staff so professional and would not hesitate in recommending the company. I absolutely love my new kitchen! Commented: what colour grout?Hi Colleen, unfortunately I won't be able to answer this question for you. 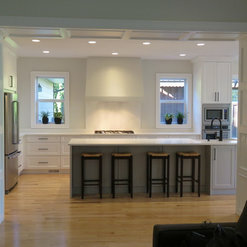 This is something the client did after we installed the cabinets.